Demands that the world replace fossil fuels with wind, solar and biofuel energy – to prevent supposed catastrophes caused by manmade global warming and climate change – ignore three fundamental flaws. 1) In the Real World outside the realm of computer models, the unprecedented warming and disasters are simply not happening: not with temperatures, rising seas, extreme weather or other alleged problems. 2) The process of convicting oil, gas, coal and carbon dioxide emissions of climate cataclysms has been unscientific and disingenuous. It ignores fluctuations in solar energy, cosmic rays, oceanic currents and multiple other powerful natural forces that have controlled Earth’s climate since the dawn of time, dwarfing any role played by CO2. It ignores the enormous benefits of carbon-based energy that created and still powers the modern world, and continues to lift billions out of poverty, disease and early death. It assigns only costs to carbon dioxide emissions, and ignores how rising atmospheric levels of this plant-fertilizing molecule are reducing deserts and improving forests, grasslands, drought resistance, crop yields and human nutrition. It also ignores the huge costs inflicted by anti-carbon restrictions that drive up energy prices, kill jobs, and fall hardest on poor, minority and blue-collar families in industrialized nations – and perpetuate poverty, misery, disease, malnutrition and early death in developing countries. 3) Renewable energy proponents pay little or no attention to the land and raw material requirements, and associated environmental impacts, of wind, solar and biofuel programs on scales required to meet mankind’s current and growing energy needs, especially as poor countries improve their living standards. We properly insist on multiple detailed studies of every oil, gas, coal, pipeline, refinery, power plant and other fossil fuel project. Until recently, however, even the most absurd catastrophic climate change claims behind renewable energy programs, mandates and subsidies could not be questioned. Just as bad, climate campaigners, government agencies and courts have never examined the land use, raw material, energy, water, wildlife, human health and other impacts of supposed wind, solar, biofuel and battery alternatives to fossil fuels – or of the transmission lines and other systems needed to carry electricity and liquid and gaseous renewable fuels thousands of miles to cities, towns and farms. It is essential that we conduct rigorous studies now, before pushing further ahead. The Environmental Protection Agency, Department of Energy and Interior Department should do so immediately. States, other nations, private sector companies, think tanks and NGOs can and should do their own analyses. The studies can blithely assume these expensive, intermittent, weather-dependent alternatives can actually replace fossil fuels. But they need to assess the environmental impacts of doing so. Renewable energy companies, industries and advocates are notorious for hiding, minimizing, obfuscating or misrepresenting their environmental and human health impacts. They demand and receive exemptions from health and endangered species laws that apply to other industries. They make promises they cannot keep about being able to safely replace fossil fuels that now provide over 80% of US and global energy. A few articles have noted some of the serious environmental, toxic/radioactive waste, human health and child labor issues inherent in mining rare earth and cobalt/lithium deposits. However, we now need quantitative studies – detailed, rigorous, honest, transparent, cradle-to-grave, peer-reviewed analyses. The back-of-the-envelope calculations that follow provide a template. I cannot vouch for any of them. But our governments need to conduct full-blown studies forthwith – before they commit us to spending tens of trillions of dollars on renewable energy schemes, mandates and subsidies that could blanket continents with wind turbines, solar panels, biofuel crops and battery arrays; destroy habitats and wildlife; kill jobs, impoverish families and bankrupt economies; impair our livelihoods, living standards and liberties; and put our lives under the control of unelected, unaccountable state, federal and international rulers – without having a clue whether these supposed alternatives are remotely economical or sustainable. Ethanol derived from corn grown on 40,000,000 acres now provides the equivalent of 10% of US gasoline – and requires billions of gallons of water, and enormous quantities of fertilizer and energy. What would it take to replace 100% of US gasoline? To replace the entire world’s motor fuels? Solar panels on Nevada’s Nellis Air Force Base generate 15 megawatts of electricity perhaps 30% of the year from 140 acres. Arizona’s Palo Verde nuclear power plant generates 900 times more electricity, from less land, some 95% of the year. Generating Palo Verde’s output via Nellis technology would require land area ten times larger than Washington, DC – and would still provide electricity unpredictably only 30% of the time. Now run those solar numbers for the 3.5 billion megawatt-hours generated nationwide in 2016. Modern coal or gas-fired power plants use less than 300 acres to generate 600 megawatts 95% of the time. 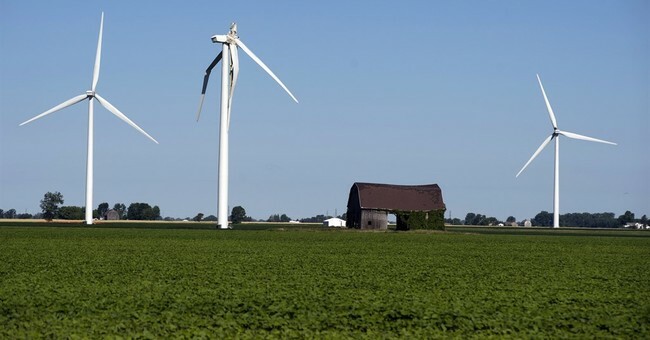 Indiana’s 600-MW Fowler Ridge wind farm covers 50,000 acres and generates electricity about 30% of the year. Calculate the turbine and acreage requirements for 3.5 billion MWH of wind electricity. Delving more deeply, generating 20% of US electricity with wind power would require up to 185,000 1.5-MW turbines, 19,000 miles of new transmission lines, 18 million acres, and 245 million tons of concrete, steel, copper, fiberglass and rare earths – plus fossil-fuel back-up generators for the 75-80% of the year that winds nationwide are barely blowing and the turbines are not producing electricity. Energy analyst David Wells has calculated that replacing 160,000 teraWatt-hours of total global energy consumption with wind would require 183,400,000 turbines needing roughly: 461,000,000,000 tons of steel for the towers; 460,00,000,000 tons of steel and concrete for the foundations; 59,000,000,000 tons of copper, steel and alloys for the turbines; 738,000,000 tons of neodymium for turbine magnets; 14,700,000,000 tons of steel and complex composite materials for the nacelles; 11,000,000,000 tons of complex petroleum-based composites for the rotors; and massive quantities of other raw materials – all of which must be mined, processed, manufactured into finished products and shipped around the world. Assuming 25 acres per turbine, the turbines would require 4,585,000,000 hectares (11,330,000,000 acres) – nearly twice the land area of North America! Wells adds: Shipping just the iron ore to build the turbines would require nearly 3 million voyages in huge ships that would consume 13 billion tons of bunker fuel (heavy oil) in the process. And converting that ore to iron and steel would require 473 billion tons of coking coal, demanding another 1.2 million sea voyages, consuming another 6 billion tons of bunker fuel. For sustainability disciples: Does Earth have enough of these raw materials for this transformation? It gets worse. These numbers do not include the ultra-long transmission lines required to carry electricity from windy locations to distant cities. Moreover, Irina Slav points out, wind turbines, solar panels and solar thermal installations cannot produce high enough heat to melt silica, iron or other metals – and certainly cannot generate the required power on a reliable enough basis to operate smelters and factories. Wind turbines (and solar panels) last just 20 years or so (less in salt water environments) – while coal, gas and nuclear power plants last 35-50 years and require far less land and raw materials. That means we would have tear down, haul away and replace far more “renewable” generators twice as often; dispose of or recycle their component parts (and toxic or radioactive wastes); and mine, process and ship more ores. Finally, their intermittent electricity output means they couldn’t guarantee you could boil an egg, run an assembly line, surf the internet or complete a heart transplant when you need to. So we store their output in massive battery arrays, you say. OK. Let’s calculate the land, energy and raw materials for that. While we’re at it, let’s add in the requirements for building and recharging 100% electric vehicle fleets. Then there are the bird and bat deaths, wildlife losses from destroying habitats, and human health impacts from wind turbine noise and flicker. These also need to be examined – fully and honestly – along with the effects of skyrocketing renewable energy prices on every aspect of this transition and our lives. The good news is that these essential analyses will provide job security for EPA and other scientists, modelers and regulators previously engaged in alarmist, biased climate chaos studies. Let’s get started.